Reducing the generation of electrostatic charges is the main purpose of control measures in ESD protected areas (EPA). 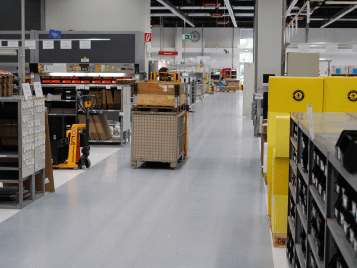 In such areas like electronics assembly, mechatronics and datacenters, the right floor covering plays a crucial role. It does not only drain electrostatic charges from personnel and equipment, but it also reduces the generation of charges there where they occur, at the interface between the shoe soles and the floor. The unique construction of Colorex SD/EC, completely free from volatile antistatic chemicals, ensures a permanent and stable conductive performance of the floor over its entire life time, totally independent from humidity and temperature. Forbo Flooring guarantees highest safety. We measure the electrical resistance of every single production batch of Colorex SD/EC and deliver upon request a test report clearly showing the results of our measurements. It is a natural fact that anybody can accumulate electrostatic charge just by simple motion or walking. By wearing the appropriate ESD shoes however, these charges will be securely drained through the dense network of conductive veins of Colorex SD/EC. 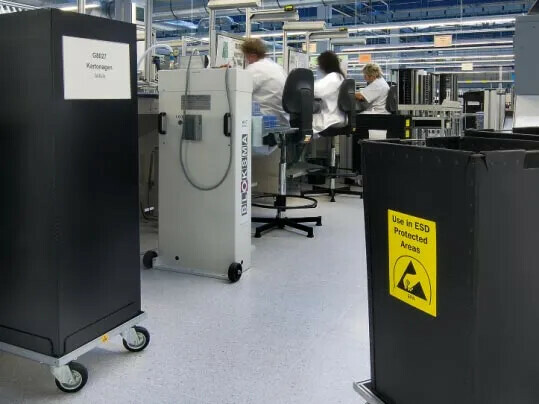 Colorex is an advanced technical flooring system specifically designed to control static discharge in sensitive areas such a cleanrooms, operating theatres and the electronics industry. Colorex can be used in many applications. It can be installed by fully adhering it directly to a subfloor or bonding it to a raised access floor panel. It can also be laid as part of a loose lay tile system. Colorex is available with three levels of conductivity - Highperformance, Performance and Standard. The loose lay slip resistant version (R11 Plus) completes the comprehensive Colorex high tech solutions offer.